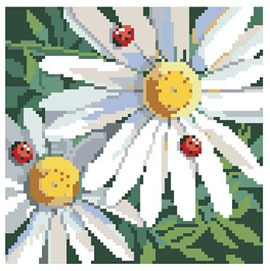 Ladybugs and Daisies make lovely companions in this colorful design by Nancy Rossi. Stitch the design on large count Monk’s cloth for a beautiful accent pillow. Contents: Stitch Count 84w X 84h, Finished Size: 6" x 6"